Once, in a moment of complete insanity, I signed up for a month-long hiking trip in Montana. It was organized by an outdoor leadership school for adults. And yet, the people in my group were hanging on by a very thin thread. One of the women had been dumped by her professor and couldn’t stop crying. Another was depressed. One of the guys had anger management issues. And four people that I knew of had had their “last cigarette” in the parking lot before the bus took us to the middle of nowhere. And it really was the middle of nowhere. We navigated with topographical maps and compasses, covering ten miles a day up and down mountains. We had a guide named Sky, but there were no trails or signs–just a radio Sky could use to communicate with planes overhead in case of an emergency. As far as I was concerned, the entire situation was an emergency. There were no showers, no bathrooms, no internet and no beds–just bugs in our ears at night and rattlesnakes curled up in our frying pans in the morning. I carried the cookware, water purification pills, and food: dehydrated chili, pancake mix, powdered milk, hot chocolate, pasta, rice, peanut butter, sesame sticks, and spices. I also had a cookbook with campsite recipes in it–things like pancakes, cornbread, and spaghetti. One night, after a harrowing day spent fording streams and pulling each other out of bogs, we pitched our camp on the edge of a wide field. It was a nice field–full of tall grass and prairie dogs. It was my turn to cook dinner for everyone. I decided to make polenta, even though it wasn’t in the book. I don’t know what happened out there, but instead of polenta I wound up with a salty, gelatinous gruel. It was like something out of Oliver Twist. There was no way to fix it–we had no butter and no cheese. We had limited food rations, and if I didn’t serve it we’d have to skip a meal. As soon as I took it off the fire, a cloudy film formed across the surface. I spooned it into bowls, and it congealed into a sort of corn-water jello. The guy with anger management issues stared at it, adjusted his hat, and walked slowly into the woods. Even Sky, who had been hired for his tremendous optimism and his hippie joie de vivre, looked upset. We had a lot of uneaten gruel that night. Disposing of it wouldn’t have been a big deal, but we were bound to a “leave no trace” hiking philosophy. We weren’t supposed to produce any trash. We were supposed to pee 200-feet from any stream so we didn’t mess up the pH of the water. We were even supposed to spit our toothpaste out in a wide arc so we didn’t leave globs of it on the ground. We were definitely not supposed to pour cold gruel down any prairie dog holes when Sky wasn’t looking. But the consensus was we absolutely could not eat left-over gruel for breakfast. 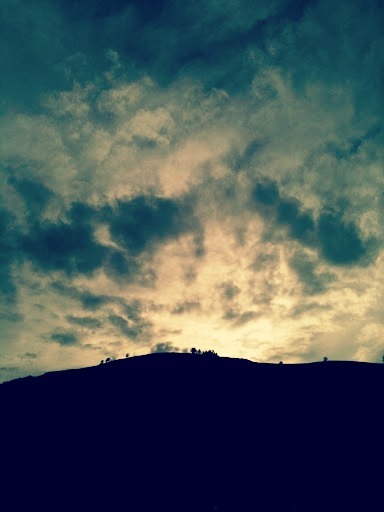 So we waited for the sun to set. And then we slipped into the tall grass and scraped our bowls clean. I returned to camp covered in dust and dirt, my conscience heavy with the possibility that I had murdered a prairie dog, or perhaps a prairie dog family. That night, as I lay in my sleeping bag in the great wide open, I swore on every star in that deep, twinkling sky that I would never hike again. I haven’t hiked since. It just isn’t for me. But that’s alright. People find beauty in different things. What matters is that we rush out into the world. We don’t have to cover any vast distances or anything; we just need to get out there and look around. Because we only have this one chance. Read this poem, my friends, because it says it better than I can. Then you should probably eat some waffles, grab someone you like, and get out there. About those waffles. . .
Those ham and cheese waffles. . . They are every bit as amazing as they sound. They’re made with soda water and baking powder, and they are the lightest, fluffiest waffles I’ve ever had. Then there’s the fact that when you bite into them, you get little bits of ham and tiny pockets of melted cheese. I mean, please. Even a prairie dog would gladly open his home and invite you to shove some of these down there. The recipe is straight from Bon Appetit. Here’s the link–I didn’t change a thing except I used regular cheddar cheese. They’re so flavorful that we eat them plain, sometimes with a little jam. I wonder if a polenta plug (Hah! My spell check wants me to spell it “tadpole plug”) would work to get rid of whatever is digging holes in my bank. I think it’s rats. I would sacrifice all the corn in the state of Washington to the King of the Rathole Gods if it meant they would stop digging up my bank. (Spell check suggests “Ra thole” for “rathole.” ‘Cuz that makes sense.) Anyway, on a related note: Yum Waffles. How do you manage to be funny and inspirational at the same time? It’s a beautiful Sunday morning in Virginia – I think I’ll take your advice and spend at least some of the day out there. Thank you! Ugh. I bet those prairie dogs were super-excited to get something new to eat. ; ) But I definitely don’t have unfailing optimism in the midst of the wilderness with only gruel for dinner. I would have been crying and begging God to send me Snickers bars or something. Funny post. Love the poem. It made me teary. Agreed on all accounts! But mostly on the poem. Beautiful. When we were young, my husband used to wake me up just because he missed me or wanted to show me something. So that poem sort of broke my heart, because these days he wouldn’t dare wake me for fear of having his head bitten off. I do still need my sleep, but I think I’m going to recommit to GET OUT THERE. Thanks. Julie, your comment was so honest and touching. I’ve been like that too. Sometimes I answer in a not loving way when there is a loving, alternative way to interact with the people I care about. I have to remind myself of that all the time. Wow, what a story! I love hiking, but I definitely understand its not meant for everyone. Like you said, its just about getting out there! And by the way, the waffles look fantastic! Thanks for the share! 1. Camping – and, in fact, any activities involving the out of doors – are my worst nightmare. Oh, and cruise ships. They’re up there too. 2. I agree with Mom up there – thanks for the inspiration. Just the thing needed before rushing into next week. Hard. 3. Please make me waffles. 4. An earwig tried to crawl into my ear this summer. Did I tell you that? It was in OUR BED. 5. I think that’s it. If I come up with any more points, I’ll be sure to come back. Hard. About number 4–the earwig situation. Perhaps it will improve if you don’t eat moth crackers in your bed. Or anywhere else for that matter. Wow, I’m impressed that you did a month-long hike, without knowing anyone! Sounds like it was…interesting. I hope you’ll try hiking again with people you like spending time with, and food you like eating, because i think it would be much more enjoyable 😉 Also, that poem is so lovely. I’m going to go back up and read it again. 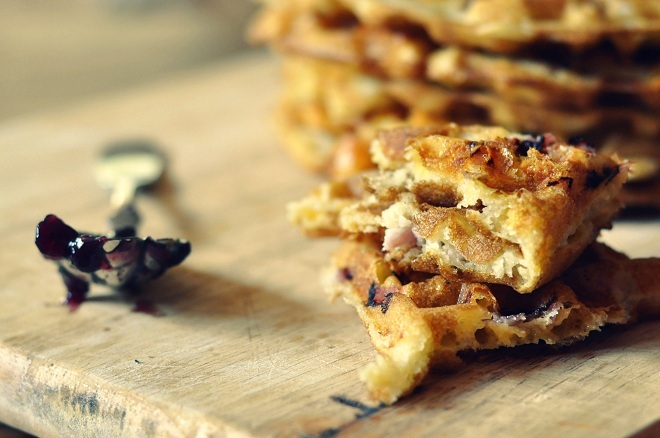 And ham and cheese waffles sounds like the greatest breakfast idea ever…way better than cold gruel. I’m still reeling from the idea of a month-long hiking trip. I’m out, typically, 20 minutes in. Bravo. Thank you. I had a cruddy job evaluation last week and I wound up spending some of this weekend trying to re-evaluate what I do and why I do it. You reminded me that I need to spend time on other parts of my life as well (not involving work). I thought it was pretty funny that the hiking company had to put that warning in their brochure, but clearly it was necessary, albeit ignored. I so want to have a waffle maker! Now I’ve read your post I WILL find one! That hiking trip sounds like one to avoid in future! Thunder: Pocket of cheese? Oh, there it is! When I was in Army Cadets we went out into the bush for a weekend in October, in Canada. Everyone knows it’s a little colder up there, especially after Labour Day weekend, even more so as Halloween approaches. Yet there we were, bunch of teens in camo and the weather took a nose dive. Flakes of snow appeared out of nowhere. Captian said we’d better get our tents up before the ground gets wet, because we were sleeping on the ground. I was on the outter edge of the tent, the canvas flapped in the -18ºC winds. 3am fire shift and the dumbass before me let it go out. Cold, dark, and damp I stuggled to light it again. I survived and don’t mind camping, so long as there’s an outhouse! What an awesome post, Katherine. I loved the poem, and how very, very true. And waffles! Soda water! I’ve made pancakes using soda water and I couldn’t agree with you more, the addition of that one, humble ingredient just turns out the fluffiest pancakes ever! Waffles or pancakes…one thing’s for dang sure…soda water, yes! That’s a great story, and now that the hike is over aren’t you glad you have it to tell us? I am. And a very good poem that makes me a little sad while urging me on. 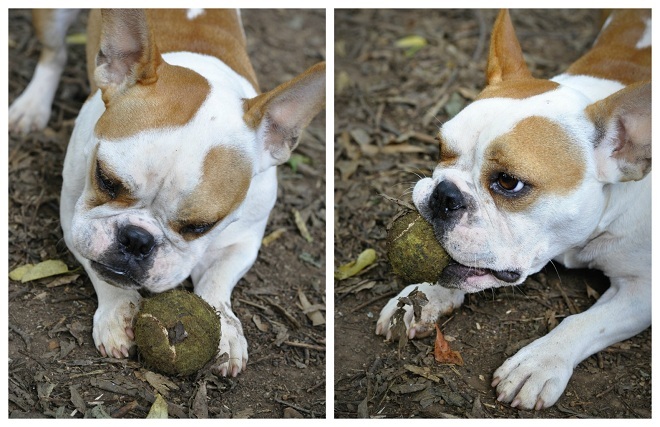 And to sum it up, that is one scrumptious-looking tennis ball. My dog used to carry one around by its fuzz so it hung right off the front edge of his mouth. That truly sounds like my idea of hell (the hiking). The waffles, however, sound like my idea of heaven. Your hiking trip sounds like a hell that was designed just for me. I must admit, though, that you transformed the experience into a great read! 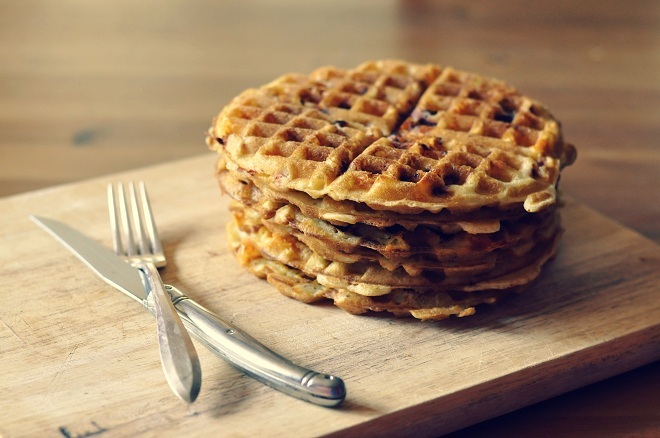 And thanks for that waffle recipe — definitely giving that a try soon! Thank you, everyone, for the kind comments! It’s always a little scary to write something a little different, and your warm reception meant a lot to me. Long live poems, waffles and being gloriously awake! YES, DANA, IT WAS!! Have you gone on any of their alumni stuff? The trip remains one of the most emotionally complicated things I’ve ever done. I’m very glad I went. It still empowers me. You? It was probably one of the best experiences of my life! It TOTALLY empowers! I have SO much more confidence in the woods now, and I did things on that course that I NEVER thought I could do! Like scale a mountain with a 60lb backpack on loose boulders in a snowstorm or canoe in something other than completely still water. 🙂 But there ya go, I did it! That being said, TOTALLY trying experience…one guy left a week in, my feet looked like raisins for about a month after, and I have never missed a lettuce leaf more than in those 30 days. And when the guy left a week in and got into the nice, heated truck, we all definitely cried a little standing out in the rainy slush.